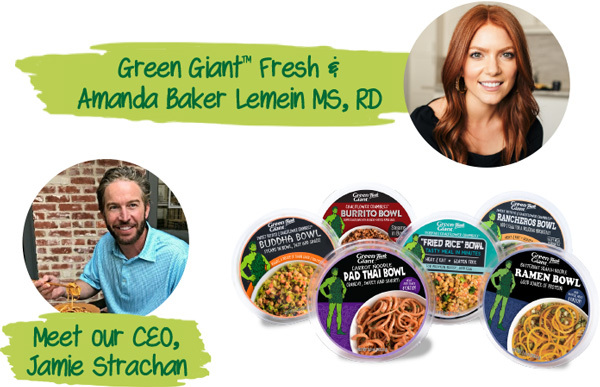 Join the Green Giant™ Fresh CEO for a Tasting and Happy Hour this Monday! Subject: Join the Green Giant™ Fresh CEO for a Tasting and Happy Hour this Monday! Join us for an experiential happy hour tasting of new Green Giant™ Fresh Vegetable Meal Bowls. Learn about the latest taste innovation from Green Giant Fresh, build your own bowl over cocktails and meet Jamie Strachan, CEO of Growers Express/Green Giant Fresh. Attendees will receive a swag bag from Green Giant Fresh. Green Giant™ Fresh, a leading innovator in value-added produce, has expanded its fresh vegetable offerings with a delicious spin on trendy meal bowls. Featuring a growing variety of authentic global flavors, Vegetable Meal Bowls are available in the refrigerated produce section at grocers nationwide at a suggested retail price of $3.99 per bowl. Green Giant Fresh Vegetable Meal Bowls are satisfying on their own or can be customized to fit a recipe, diet or taste. Each bowl includes a 100% fresh vegetable base, inspired by the Company’s first-to-market Cauliflower Crumbles line and the Vegetable Noodle line, with unique and flavorful sauces and seasoning packets, ranging from sweet and tangy to zesty and savory. Some Vegetable Meal Bowl varieties are vegan-friendly, and each Vegetable Meal Bowl is gluten-free and packaged in a microwave-safe container. The line includes six delicious varieties: Buddha Bowl, Burrito Bowl, “Fried Rice” Bowl, Pad Thai Bowl, Ramen Bowl and Rancheros Bowl. Learn more at greengiantfresh.com.